Philips Sonicare InterCare toothbrush head features extra-long, high-density bristles to target hidden plaque caught deep between teeth and other hard-to-clean areas. The dynamic cleaning action of this toothbrush and the direct broader contact with each tooth, has proven to remove everyday stains, to help keep teeth naturally whiter. 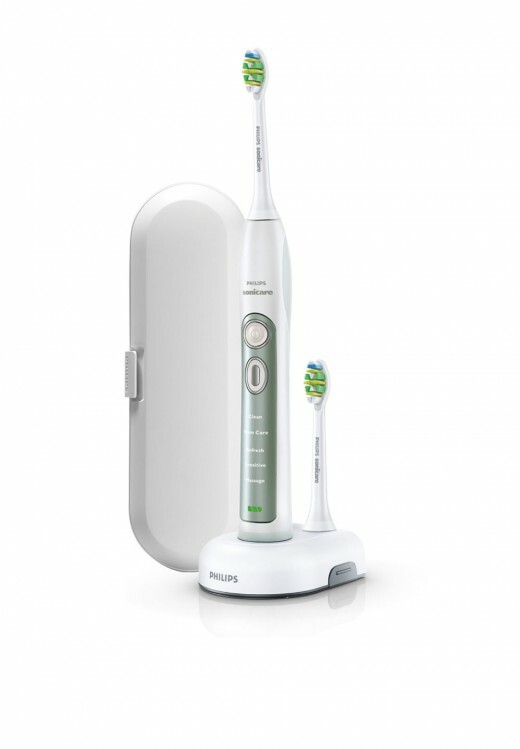 This Philips Sonicare electric toothbrush provides optimal cleaning along the gumline for improved gum health in just two weeks. Up to 6x better plaque removal than a manual toothbrush at the gumline. The five modes include a Clean mode for an outstanding clean in two minutes. A Sensitive mode for gentle yet thorough cleaning of the gums. A Refresh mode for those quick one minute touch-ups. A Massage mode to stimulate the gum and a Gum Care mode that helps improve gum health.